A parallelogram is a quadrilateral whose opposite sides are parallel. In this post, we show that asides from being parallel, they are also congruent. 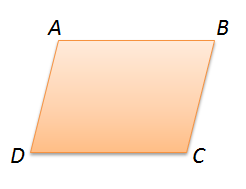 In the figure below, is a parallelogram; is parallel to and is parallel to . To prove that the opposite sides of are congruent, we have to show that and . 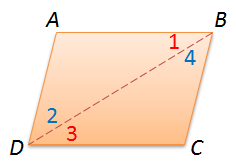 Theorem: The opposite sides of a parallelogram are congruent. Notice that serves as a transversal to the parallel line segments. Clearly, because they are alternate interior angles (A). Also, since any segment is congruent to itself (S). Therefore, and since corresponding sides of congruent triangles are congruent. So, the opposite sides of a parallelogram are congruent.